Whether you are aware of it or not, your children are enthusiastic shoppers. Each and every day children are bombarded with messages urging them to choose snack foods, sodas, and other processed sugary foods. Unfortunately the supermarket is not a safe haven from these messages. With sugary cereals placed at a child’s eye level and checkout lines stocked full of gum, candy, and chips it’s no wonder children’s food requests are not for that fresh apple or whole wheat bread. 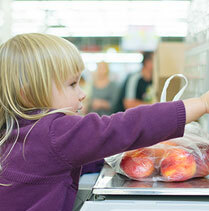 Here are four tips to help make your trip to the grocery store family friendly and healthy. Get your children involved. To avoid purchasing items you don’t need, always shop with a list. Children love to help out, so give them part of your list as their own. Another idea, play the rainbow game! Children must select a fresh fruit or vegetable of every color of the rainbow to be eaten during the week. Encourage variety and try items you may not have tried before. Don’t visit every aisle. By shopping with a list you no longer have to visit every aisle in the grocery store. This will cut down the amount of time spent in the store and also save you from purchasing items you do not need. Furthermore, use the candy free check-out aisle when available. If your grocery store doesn’t have one, write a letter to the manager to see if one can be created. Shop in the periphery. When looking at the layout of your grocery store you’ll notice that the least processed foods, such as dairy, fruits, vegetables, and meat, can be found along the walls of the grocery store. As you move toward the center of the store, you’ll find the processed foods, such as chips, candy, cookies and crackers that catch children’s eyes. Practice shopping cart safety. You wouldn’t ride in a car without a seatbelt or a bike without a helmet, so don’t let your child ride in a moving shopping cart without a safety harness. Children should also be reminded that it’s unsafe to ride on the outside of the cart or standing in the basket of the cart. Check with your grocery store to see if they have special children’s carts. The most effective way to get your children to eat healthy is to have healthy food available in your home. If you don’t want your children eating junk food, don’t buy it. Six Tips That Encourage Your Family to Dine Healthy!